Atopica, (aka Cyclosporine) is used for the treatment of atopic dermatitis (commonly called skin allergies) in dogs, which is a non-contagious skin disease characterized by chronic inflammation of the skin. Signs of skin allergies include itching, scratching, licking, gnawing, chewing, skin infections, hair loss, terrible odor, and sleepless nights.While its not approved by the FDA for cats, it is commonly prescribed by veterinarians to treat cats. How does Atopica for Dogs work? Not for human use. Keep this and all drugs out of the reach of children. For use in dogs only. Wear gloves during administration. Capsules should not be broken or opened. Wash hands after administration. In case of accidental ingestion, seek medical advice immediately and provide the package insert or the label to the physician. There are many possible drug interactions. Be sure to tell your veterinarian what other medications your pet is currently using. Give Atopica at least one hour before food or 2 hours after food. What is the most important thing I should know about Atopica for Dogs? Notify your veterinarian immediately if your pet develops fever (over 103°), painful urination, tiredness, sneezing, coughing, or runny nose. These symptoms could be early signs of dangerous side effects. What is Atopica for Dogs? 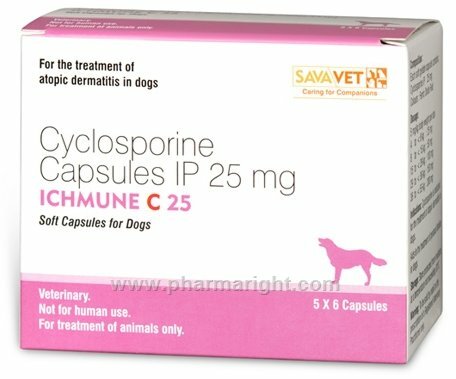 Atopica for Dogs (cyclosporine modified) is an immunosuppressant available by prescription. Atopica is FDA approved for use in the treatment of atopic dermatitis in dogs at least 6 months of age weighing at least 4 lbs. Atopica for Dogs is available in 15 capsule blister packs in strengths of 10 mg for dogs 4-9 lbs, 25 mg for dogs 9.1-16 lbs, 50 mg for dogs 16.1-33 lbs and 100 mg for dogs 33.1-64 lbs. For dogs 64.1-79 lbs, give a combination of one 100 mg capsule and one 50 mg capsule as a single dose. For dogs 79.1-121 lbs give, two 100 mg capsules as a single dose. Atopica for Dogs is given once a day to start until satisfactory improvement is seen, usually 4 to 8 weeks. The medication can then be given every other day until the clinical signs of atopic dermatitis are satisfactorily controlled, then the medication can be given every 3 or 4 days. What should I discuss with my veterinarian before giving Atopica for Dogs? Tell your veterinarian if your pet has liver disease, kidney disease, cancer, high blood pressure, a viral, bacterial or fungal infection, or any other serious or chronic condition. Tell your veterinarian if your pet is pregnant or lactating, and if you plan to breed your pet. How should Atopica for Dogs be given? Give Atopica for Dogs exactly as directed by your veterinarian. If you do not understand these directions, ask your veterinarian or pharmacist to explain them to you. Give Atopica for Dogs 1 hour before or 2 hours after a meal. Allow plenty of water for the pet to drink. Do not remove a capsule from the blister pack until required for use. When the capsule is removed from the blister pack there is a characteristic, noticeable smell which is normal. Wear gloves during administration. Capsules should not be broken or opened. Wash hands after administration. Your veterinarian may want your pet to have regularly scheduled blood tests during treatment to monitor effectiveness and side effects. What are the potential side effects of Atopica for Dogs? If any of the following serious side effects occur, stop giving Atopica for Dogs to your pet and seek emergency veterinary medical attention: an allergic reaction (difficulty breathing, swelling of the lips, tongue or face, and hives). Other less serious side effects may occur. Continue giving Atopica for Dogs and talk to your veterinarian if your pet develops vomiting, soft stools or diarrhea, muscle cramps, muscle weakness, loss of appetite, and change of hair coat. Other side effects may occur. Talk to your veterinarian about any side effect that seems unusual or bothersome to your pet. What happens if I miss giving a dose of Atopica for Dogs? What happens if I overdose my pet on Atopica for Dogs? What should I avoid while giving Atopica for Dogs to my pet? The safe use in breeding, pregnant or lactating pets has not been determined. Do not use Atopica for Dogs in pets with known allergy to the medication. The drug should not be used in pets with kidney disease, stomach ulcers, and certain blood disorders. Prolonged use of Atopica can result in bacterial or fungal infection related to a decreased effect of the immune system. What other drugs will affect Atopica for Dogs? Tell your veterinarian what medications your pet is currently using and any new products, including herbal remedies you may start to give. Drug/drug interactions could cause a decrease in effectiveness or an increase in side effects of either Atopica or the other medication being given. Examples of medications that may cause drug/drug interactions are: SMZ-TMP (Bactrim, Septra), gentamicin, etodolac (EtoGesic), piroxicam (Feldene), ketoconazole (Nizoral), cimetidine (Tagamet), ranitidine (Zantac), itraconazole (Sporanox), methylprednisolone (Medrol), erythromycin, Allopurinol (Zyloprim), metoclopramide (Reglan), prednisolone, digoxin (Lanoxin), or any type of vaccination.